You can support the Adam Art Gallery by becoming a Volunteer. Volunteers play a vital role in what we do at the Adam Art Gallery, whether it’s assisting in day-to-day operations, with special projects, behind the scenes, or at public events. We’re extremely grateful for the contributions our volunteers make. In return, we set out to provide a positive, educational and enriching experience. We hope you’ll enjoy being part of our team. The Volunteer Programme offers individuals a behind-the-scenes perspective of a university art gallery, provides opportunities to work alongside professionals working in the arts, gain practical experience relevant to a multitude of career paths, develop interest in art, and meet others who share this interest. The Volunteer Programme is open to all: students and non-students alike with the average number of volunteers ranging from about 40-60 members. Participation varies depending on an individual’s availability, areas and level of interest, with the gallery reserving the right to align volunteers’ interests and skills with tasks and roles that are suitable to the gallery’s needs. The gallery maintains a high standard of professionalism and instills this in the volunteers who work with us. 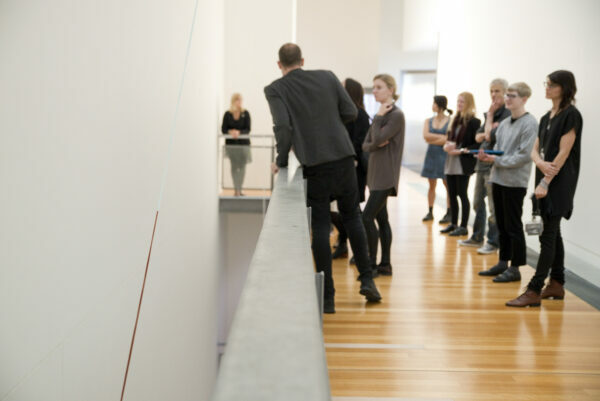 Gallery attendants play a crucial role as they are the first point of contact for gallery visitors. Responsibilities include: being knowledgeable about the current exhibition and directing visitors to resources as needed; supervising the gallery spaces to ensure the safety of the artworks; directing queries to relevant staff members; being knowledgeable about emergency procedures. Providing administrative support is essential to the gallery’s operation. Tasks may include: assisting with organisation of the gallery’s exhibition archive; assembling publicity reports; distributing publications; updating the gallery’s website. Attend our fascinating and fun events while lending a hand as a volunteer. Responsibilities may include: setting up for events; greeting and ushering guests; assisting with audio/visual needs; documenting events with photos or recordings; distributing flyers and posters. • Gain practical experience and transferable skills valuable on any resumé. • A stepping stone to a career in the arts. • Meet and learn from art professionals, and build your network. • Explore your interest in art by engaging with current ideas on visual culture through the gallery’s programming. • Connect with others who appreciate art. • Give back to your community by supporting a valuable cultural institution. • Students of Victoria University of Wellington can apply their volunteer hours towards the Victoria Plus service and leadership development programme. If you’re interested in the Adam Art Gallery Volunteer Programme, please read the Information Guide for full details. If you wish to become a volunteer, please fill out the Registration Form according to the instructions provided on the form.